Kids are adventurous creatures, and until the age of 6, they can be best termed as discoverers. Nothing can be scarier than seeing them discover electrical receptacles and insert metallic objects in them or try to probe them with their tiny fingers. This is one of the main reasons why an Atlanta electrical contractor gets many requests to install tamper-proof receptacles, especially in older homes. Every year, about 2700 children in America below the age of 6 are treated in emergency centers for electric shocks and burns they suffer because of inserting metal objects into a receptacle. Toddlers account for almost 50% of these victims, as these tiny tots have very delicate skin that offers little protection against electric currents. The National Fire Protection Association has now deemed the use of tamper-resistant receptacles compulsory in all dwellings with 15-20 ampere and 120 Volt receptacles. 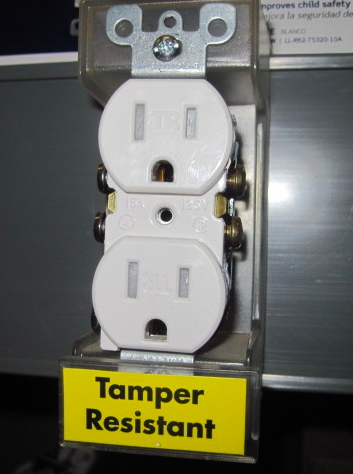 Tamper resistant receptacles have been around for the past decade, but it was only in the 2008 National Electrical Code (NEC) that their use was made mandatory in all the newly constructed homes. Though we never think twice about spending money when it comes to the safety of our children and grandchildren, you will still be happy to know that tamper proof receptacles cost just about half a dollar more than the standard devices. Therefore, they are economically, and extremely effective devices. These receptacles have the same look and feel like their older cousins, but their internal architecture is totally different. A tamper resistant receptacle is designed with an internal shutter system that instantly closes its slots when it is not being used. The shutters will open only when a two-pronged device is inserted into it and will remain shut when a toddler tries to probe it by using a hairpin or nail in just one slot. Your child will thus be protected against electrical burns and electrocution when these devices are installed. Replacing your old receptacles with these new devices is an easy task that could be performed by electrical contractors in Atlanta within a matter of minutes. No new wiring is needed to install tamper-resistant receptacles. Make your home safer for your kids by opting for these cheap and yet valuable devices.